This past week I received an email from someone I respect very much, offering help on guiding patients with fatty liver disease. He is an expert on environmental medicine and the effects of toxic exposures (including pesticides, volatile organic chemicals and heavy metals) on the body. I had reached out to him because I had watched one of his integrative medicine lectures and he mentioned a detox protocol he uses in patients with fatty liver disease to help heal the liver and reduce the risk of progression to cirrhosis. When I heard that, I knew I had to reach out and ask for help. You see, as a family doctor who works with LOTS of people who are overweight and obese, I have a lot of patients with fatty liver disease. And like most other medical professionals, although I know fatty liver disease has about a 25% chance of progressing to liver cirrhosis and liver failure and is one of the leading causes of liver transplant, I don’t have much to offer in terms of treatment. Receiving my colleague’s email was really exciting for me, but when I opened it I found there a LOT of herbal and dietary supplements on the protocol. This presents a problem for me as a medical professional. What do these claims mean? Not much, actually. All supplement manufacturers make these exact same claims, because those are the only claims they are allowed to make. Here is an example. You all know I work with the Shaklee Corporation. Shaklee has sponsored 4 peer-reviewed studies, authored by Dr. Yasuhiko Kojima (the Japanese researcher that discovered interferon) about the botanical formula marketed as NutriFeron. One of the studies, published in 2004 in the Journal of Gastroenterology, showed that study participants with Hepatitis C had significant reductions in their viral titers after taking the formula for 3 months, with no major side effects. According to the DSHEA, I can tell you about the study but I can’t use the study to recommend to patients with Hepatitis C that NutriFeron would help their disease. That would be considered “treatment” and treatments must be approved by the FDA (a process that is long, arduous and much more expensive than any supplement manufacturer could support). There are lots of supplements that are used to treat diseases. Niacin treats high triglycerides. Coenzyme Q10 treats heart failure (and in fact reduces the risk of death from heart failure). Magnesium treats high blood pressure, migraines, anxiety and insomnia. Potassium citrate treats osteoporosis and kidney stones. But I can’t say so. So if you see me in the office, and I tell you that a certain vitamin or mineral or supplement would help you, please feel free to ask questions and clarify why that product would help. Just be mindful that supplements don’t “treat” disease. They build health and wellness, make your immune system work better, help manage stress, promote heart health and optimal blood cholesterol, help you lose weight and encourage healthy sleep. But they don’t treat disease. PS – Thanks to Dr. David Katz for his article in the Huffington Post, which prompted this post. QUESTION: Do you take supplements? Do you feel supplement manufacturers should be able to make disease claims IF they have the research and quality data to back it up? Imagine a world where walking down the street and passing someone wearing perfume causes shortness of breath and cough. Doctors need to treat you for a medical condition but every medication you try causes intolerable side effects. Working at a computer for any length of time causes blurry vision, headaches and dizziness. Eating out at a restaurant is impossible because you have so many food intolerances you’re guaranteed to react to anything you eat. This is what life can be like when you suffer from Idiopathic Environmental Intolerance (IEI). I have a mild form of IEI, having a number of moderate to severe food intolerances. However my symptoms are manageable and don’t impact my life significantly as long as I avoid my trigger foods. What if the entire WORLD triggered your symptoms? This is what happens when you have Multiple Chemical Sensitivity (MCS). Patients with MCS report symptoms in just about every system with exposure to substances that are generally considered safe and don’t cause problems in others. For instance, they may get muscle and joint pain, confusion and mental fogginess, abdominal pain, diarrhea or constipation, cough, shortness of breath, nasal congestion, anxiety and panic attacks, sleep problems, skin rashes and many other symptoms. I confess I don’t know much about MCS. When a patient recently came to me for an opinion about her previously-diagnosed and longstanding MCS, I had to go to the research database. Since I was doing the research anyway I thought I’d share what I found with you! Multiple Chemical Sensitivity has been recognized for decades but a search for one cause has not been successful. It seems to be a combination of neurological sensitivity and environmental exposures that interact to create illness. Exposures that have been thought to bring on MCS include heavy metals including mercury (particularly in dental fillings), chlorine and fluoride in tap water, pesticides in food, and volatile organic chemicals in everything from fabric softener to carpet. It has been shown that people with MCS have brains that react to environmental exposures just like people having a panic attack. This has led to the theory that MCS is a disorder similar to fibromyalgia. In fibromyalgia the brain and nervous system interprets sensations as painful that an ordinary person would not find painful. It seems that in MCS part of the illness sees to be the brain interpreting sensations as painful/dangerous/unpleasant that an ordinary person would find innocent or even pleasant (like perfume). How do we know if someone has Multiple Chemical Sensitivity? There is a questionnaire called the Quick Environmental Exposure and Sensitivity Inventory (QEESI) that can screen for the problem. If you or someone you know is curious about it, you can find the questionnaire here. If you have a positive questionnaire, you should take the results to your doctor to discuss. What do we do if you have Multiple Chemical Sensitivity? First of all, the patient needs to understand clearly that there is no known cause and no known cure. We can do simple things like filtering drinking water to remove chlorine, buying organic food, and using nontoxic cleaning products that don’t release volatile organic chemicals. Smart supplementation with a high-quality multivitamin and products that support the liver’s detoxification processes is helpful. Fairly simple testing can help identify triggers. Provocative testing for whole-body heavy metal burden can identify whether mercury or other metals may be contributing to symptoms. Testing for food intolerances can help adjust diet and begin healing the gut and immune system. Gamma glutamyl transferase (GGT) is a quick screening blood test to see whether the liver’s detoxification processes are overworked and can identify fatty liver disease. It is important to choose a medical doctor, functional medicine provider or naturopath that has experience in treating environmental sensitivities or is at least open to learning about them. Minimizing unnecessary drugs is helpful. A holistic, integrative approach is key. One last thing to remember is that part of the problem is in the brain. The brain of a patient with MCS misinterprets or is highly sensitized to stimulus that doesn’t bother others. There have been studies that show scans of brains of MCS patients lighting up on exposure to odors the same way brains light up during a full-blown panic attack. Why does perfume cause the equivalent of a panic attack in a patient with MCS? We don’t know, but we do know that treatments that help panic disorder (like cognitive behavior therapy and antidepressant medication) have been shown to improve the quality of life of patients with MCS. As a more extreme example, there was a patient with MCS who had significant and sustained benefit from electroconvulsive therapy. In extreme cases, patients with Multiple Chemical Sensitivity can feel forced to completely withdraw from the world and become modern-day hermits. They avoid social situations because they are afraid their symptoms will be triggered. In conclusion, Multiple Chemical Sensitivity is an uncommon (although probably more common than we realize) illness that has no known cause and no known cure. It IS real though, and more research is needed to identify risk factors, find patients early in their illness, and offer meaningful treatments to restore their quality of life. If you feel you have Multiple Chemical Sensitivity and your physician isn’t able to help you, the Academy of Integrative Health and Medicine website can offer some options. QUESTION: Do you or does someone you know seem overly sensitive to chemicals, perfumes and medications? What would it be like if it took all day to get to and from church on Sunday? What if a bath meant hauling water from the creek and heating it up on the stove? What if all you and your family had to eat was what you grew or hunted for yourself? My family and I were in Gatlinburg for a few days over Spring Break a few weeks ago. One of the highlights of our trip was a 9-mile horseback ride in the Smoky Mountains. Any nature lovers or horse lovers or birders or those who just love fresh air and sunshine should check out Great Smoky Mountain National Park, it’s awesome! While on our ride we passed several tumbledown homesteads from the original settlers of the area. Our guide pointed out watering holes and found objects like washtubs and metal bedsteads that are the only evidence humans ever lived there. The path we rode along was an old wagon track that was wide enough (barely!) for two horses to ride side-by-side. There were places where there was a sheer drop-off just next to the track, not a guard rail in sight. I thought as we rode about what life was like in a place like that. Of course, compared to some places people lived in the early 1800s, the sites we saw were practically an urban paradise. You could get to town with an hour’s walk, much faster if you rode a horse or mule. Even though just about everything people did involved more effort and planning than it does nowadays (you couldn’t just run down to the market if you ran out of sugar after all), I suspect life really wasn’t all that different then. Mothers worried about their children. Fathers (and mothers) worked hard all day to provide for their families. Young people learned their letters, practiced their faith with their families and courted each other as young people have always done. One of the hobbies I’ve been dabbling in lately is genealogy. It’s amazing how much information is available for free online! I think I’m related by blood or marriage to half of Auglaize and Mercer counties here in Ohio, LOL! I’ve traced part of my family all the way back to the 1600s. I recently found my great-great-great-grandmother’s parents’ names by checking a photo of a census report from 1860. I’ve found ancestors that died in the influenza pandemic of 1918-19, including my great-grandmother, as well as an ancestor that died of gallstones (!) and one that died of tuberculosis. I found families that had 10 or more children, and families that had just one baby girl that died in infancy. 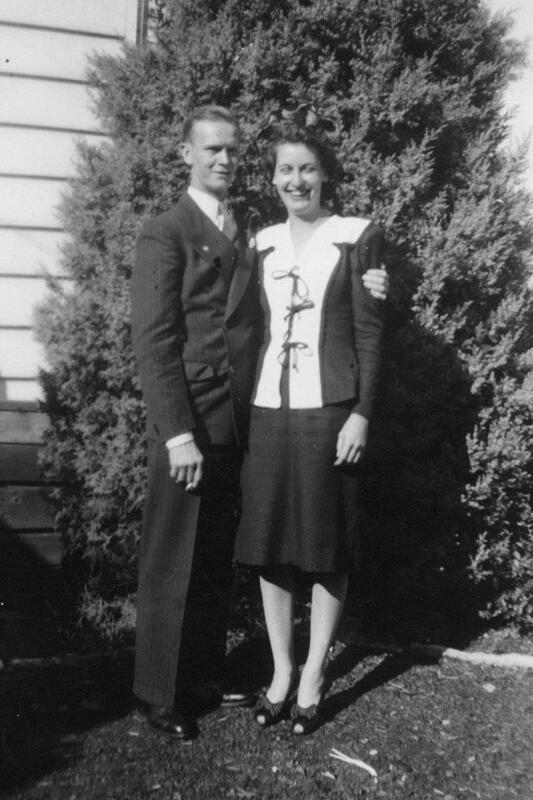 I’d like to share a photo of my grandparents on their wedding day in 1942. She is seated, and he is standing behind her. He was 29 and she was 23 years old. 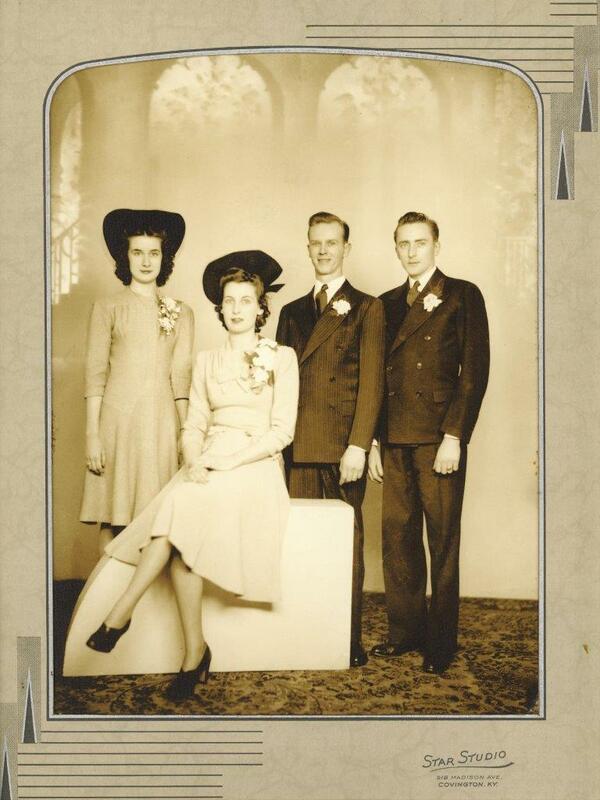 This is very different from the wedding portraits that we see nowadays. However, I can’t help but think that in many ways they were EXACTLY like modern-day brides and grooms. They are sharing a very special day with family and friends. Was she nervous? Was he? Did they want children, and were they worried about how they would provide for any children they had? She worked as a wrapper for a silverware company before they were married. Did she continue to work? Did they argue about it? I don’t know. Here is a fun, casual picture of them that I just adore. I’m not sure how old they were in this photo. See how the sun is in her eyes? She looks like she’s laughing at something off-camera, and he’s got her arm around her. But for the clothing styles this could easily be a modern-day couple. It’s easy to feel that we have nothing in common with those who lived decades ago, or hundreds of years ago. However, the more I study my family’s history, and history in general, the more I find that people are people, and we have more in common than we think. QUESTION: How do you think life is different now than it was in the 1800s? How is it the same? You almost can’t turn on the TV or pick up a newspaper today without reading about the explosion of heroin addiction and overdose deaths in the USA. In Ohio there are an average of 18 heroin overdose deaths every week. Heroin use affects urban and suburban areas, rural areas, people of all socioeconomic statuses, teenagers to older people. There is no one who is immune. As the mother of a young teenager I am terrified. How does a heroin addict get hooked? Usually they start with prescription narcotic pain medications. When I was in medical school they taught us that patients with “real” pain don’t get hooked on narcotics, don’t become addicts. We were encouraged to believe our patients’ reports of pain, if they had a physical reason to be in pain, and treat them with whatever they needed to control the pain. That is completely false. People with real pain DO get hooked on narcotics. Just like a certain number of those who drink alcohol habitually will activate an addiction, a certain number of those who use narcotics for ANY reason will activate an addiction. One of the hallmarks of dependence is a need for larger doses of medication to achieve the desired result. Even non-addicts (called users or abusers) and those who use narcotics for physical pain will become dependent on narcotics after extended use and have withdrawal symptoms when the medication is stopped. An addict, however, will engage in illegal and manipulative behavior to get more and more drugs. Negative consequences like divorce, legal problems, loss of family support and relationships, homelessness and even near-death experiences often aren’t enough to convince the addict to stop using and to get help. At some point the abuser or addict’s need for narcotics becomes so great they can’t obtain or can’t afford pills, so they switch to heroin, which is inexpensive and unfortunately very available. Heroin is usually sold in Ohio as a white powder that can be snorted or smoked, but is usually dissolved and injected. It is a sedative and in overdose causes the user to stop breathing. There is now a medication called naloxone or Narcan that is available over the counter in Ohio. Fire, police, EMT and other emergency responders in Ohio carry Narcan and are trained to administer it if they suspect there is an overdose. It works very quickly to block the opiate receptors and essentially reverses the activity of the narcotic drug. There is no one way to fight the heroin epidemic. We have to decrease casual access to narcotic pain medication, and hopefully reduce the number of new cases of addiction caused by medical treatment. In practice, that means that doctors are being asked not to prescribe narcotics for every cough and sprained ankle they see, and in cases where narcotics ARE necessary to limit the number of doses they prescribe. We have to identify and shut down those who are selling prescription pain medicine and heroin and other opiates (like fentanyl, which is a very powerful narcotic that is now responsible for nearly as many overdoses as heroin). One of the reasons heroin is such an epidemic now is because it is easy to find and inexpensive. We have to expand access to treatment programs. It is very difficult to find an spot in a treatment program for narcotic addiction. Medications like methadone and Suboxone are available to reduce the effects of addiction and help transition addicts to living clean and sober. It’s tough to get an appointment in a Suboxone or methadone clinic in a timely fashion, though. I’m not sure how we keep our kids from experimenting with drugs, short of keeping them locked up day and night. I would be a lot less frightened as a mother if I didn’t know so many teenage addicts with loving, supportive, “good” parents. Suburban white teenage kids from good homes in nice neighborhoods are dying in Ohio of heroin and fentanyl overdoses every week. If anybody out there has any good ideas about how to immunize our kids against drug abuse and addiction, I’d love to hear them. Urban, suburban, rural, middle-income, rich and poor, single-parent and two-parent household, white, black, Hispanic, Asian, religious or not, we are all at risk. QUESTION: Do you know anyone who has struggled with heroin use and/or addiction? Happy spring! You know what spring in Cleveland means, right? Allergies! Sneezing, stuffy nose and itchy, watery eyes. Coughing and wheezing for our asthmatic friends. Antihistamines, decongestants and nasal sprays in a desperate search for relief. Other than over-the-counter and sometimes prescription meds, what can be done to relieve allergy symptoms? Turns out there’s actually a lot that you can do. Toxic cleaning supplies actually contribute more than you may realize to chronic nasal congestion and respiratory symptoms. Once the weather breaks, many people open up their houses and start scrubbing the winter’s accumulation of grime from floors, windows and bathrooms. When the congestion and sneezing start, many of us blame the open windows and blooming trees, when it may actually be the fumes from the cleaning supplies. Do not use bleach, ammonia or other fume-forming cleaning supplies to clean your home. With our current energy efficiency standards our homes are essentially as airtight as we can make them, especially our newer homes. Any fumes you release in your home are trapped in there. Check the back of your cleaning product bottles. If it says “Use in a well-ventilated area,” do NOT use it in your home. For more information about the nontoxic cleaning products my family trusts, check this link. Are you eating foods that are worsening your congestion and allergy symptoms? Food intolerances can inflame the GI tract and cause the immune system to react to things that it shouldn’t. These reactions can range from chronic nasal congestion and asthma symptoms to autoimmune diseases or worse. There are a couple of ways to see if you’ve developed a food intolerance. Typical food-allergy blood tests do NOT pick up on intolerances because they only check for one antibody reaction (they are very good at detecting immediate, life-threatening food allergies like peanut allergy though). The low-cost way to check for food intolerance is to do a 2- to 3-week elimination diet. The one I use can be found here. You basically eliminate the most common food allergens from your diet for 2 to 3 weeks, then reintroduce them one at a time to see if you develop a reaction. The low-hassle way to check for food intolerance is to have a blood test. I order the ALCAT test from Cell Science Laboratories. It is fairly expensive and is not covered by insurance. However, it tests 237 different foods. If you just want to know what not to eat, that’s the way to go. 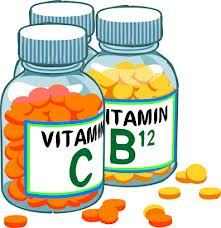 There are a number of supplements that my patients have found helpful for allergy symptoms. One is alfalfa, which is a very nutritious salad green that can be eaten as a salad or taken as a supplement. Another is NutriFeron, a patented product developed by the Japanese scientist who discovered the immune signaling molecule interferon. NutriFeron improves the health of the immune system by improving communication among the different components of the immune response. If you’re suffering with allergies this spring, don’t suffer in silence! Check what you’re using to spring-clean your home and pitch out the stuff that might be irritating your respiratory tract. Check your food intake and figure out whether you’re eating foods that might be contributing to the problem. Add supplements that can balance and improve the health of your immune system while relieving your allergy symptoms. QUESTION: How are YOUR allergies this spring? Are you going to change anything based on this post?